Gardaí say the road has now reopened. Flyover at Loughlinstown, Co. Dublin. 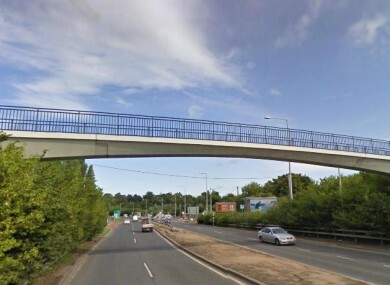 THE N11 WAS closed for a time this morning after a man threatened to jump off a flyover bridge. The man stood on the edge of the bridge located beside St. Columcille’s Hospital in Loughlinstown. The incident took place during rush hour traffic, causing both the northbound and southbound lanes to be closed. Some drivers pulled in to try and help, with one person stating that “he was standing directly over the fast lane of traffic”. Gardaí confirmed that the incident was now finished and there was no fatality. They said “professional garda negotiators” arrived at the scene to find a man standing on the ledge of the bridge. He said the team, who are specially trained to handle these situations, managed to talk the man down. The N11 has now reopened. Email “N11 closes briefly this morning after man threatened to jump off bridge”. Feedback on “N11 closes briefly this morning after man threatened to jump off bridge”.